February 26,2013.Moscow,Russia. Chebarkul meteorite is the proposed name for the fragments of the asteroid that entered the atmosphere of Earth and caused the Russian meteor event on February 15, 2013. Pictured: Vernatsky Institut of Geochemistry, Moscow. 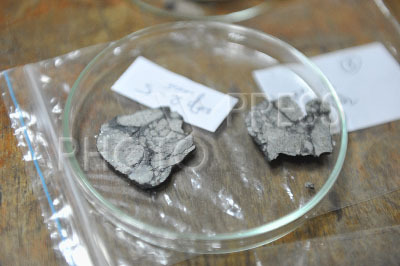 Chebarkul meteorite fragments found at Chebarkul lake.